We’d love your help. Let us know what’s wrong with this preview of John Carter of Mars by Marv Wolfman. To ask other readers questions about John Carter of Mars, please sign up. A mammoth collection of John Carter comics. 631 pages, with writers such as Chris Claremont, Peter Gillis, Bill Mantlo, Alan Weiss, and Marv Wolfman. Some of the episodes stay pretty close to ERB's tales while others spin wildly away. We get a lot more Dejah Thoris and Tars Tarkas in this collection than in ERB, which I liked. All in all, though, I much enjoyed the collection and thought it well worth the cost. I shouldn’t pine for the days when I was stupid, but I wish that I could continue to enjoy some of my childhood favorites without being gob smacked with their racism and sexism today. You lost me on this one when John Carter reminisces about the “good old days” before the war and imagines taking Dejah Thoris to a plantation ball. Then, later in the story arc, he credits his guerilla warfare skills to those honorable Southern gentlemen Nathan Bedford Forrest, founder of the first KKK, and J.E.B. Stuart. Two stars – not recommended unless, like me, Barsoom played a big role in getting you interested in SF and you can still extract some pleasure in going back to the Red Planet. This series introduced me to ERB and eventually led me to read my first John Carter novel, The Gods of Mars. Pulpy and sweet like a Danish Bakery cupcake. Tried the book far too young--didn't finish it until last year, but the comics were cheap and easy. I'd read it again. The characters of Edgar Rice Burroughs in a comic book from the 1970's! I suppose there could be someone who wouldn't like it. Just kidding. This is a gigantic collection of John Carter comics, and it's....OK. Some of the art is pretty good. Some of it is meh. Most of the writing is in that old Stan Lee Marvel style, where there's WAY too much unnecessary dialog and caption. Some of it is based on Burroughs' novels. Other parts are 'original.' Nothing is all that great. I can't really recommend it. I mean, I'm pretty sure I'm the target audience, and I had a hard time making my way through it. John Carter, Warlord of Mars, is one of the great pulp adventure properties of all time, eclipsed only by the Shadow, Doc Savage and most definitely by his literary brother Tarzan of the Apes. The series by Edgar Rice Burroughs is the epitome of fantasy wish fulfillment: a young man (sort of) feels out of touch and out of place in his contemporary world, and he longs for a world that accepts him as the gallant hero hidden inside. Lo and behold, he finds his body magically whisked to the world of John Carter, Warlord of Mars, is one of the great pulp adventure properties of all time, eclipsed only by the Shadow, Doc Savage and most definitely by his literary brother Tarzan of the Apes. The series by Edgar Rice Burroughs is the epitome of fantasy wish fulfillment: a young man (sort of) feels out of touch and out of place in his contemporary world, and he longs for a world that accepts him as the gallant hero hidden inside. Lo and behold, he finds his body magically whisked to the world of Mars where he finds a world technologically advanced by socially barbaric. Add in green 4-armed men and voluptuous martian princess and the male fantasy world is fulfilled. But the series has never had a successful sustained comic book version despite seemingly obvious strengths of handsome, noble men, beautiful women and derring do. In the late 70s, Marvel Comics acquired the rights to produce a John Carter series and this book collects that series in its entirety. First let me say that the reproduction and paper type are fantastic (as mentioned by a previous reviewer). Everything is crisp and clean. The number of comics contained herein also offers a good value for your buck. But I found myself deeply disappointed by the content and feel I should have purchased something else. The book roughly falls into 3 sections. The first section features the initial arc The Air Pirates of Mars, by Marv Wolfman, artist Gil Kane and inkers Dave Cockrum and Rudy Nebres. Marv Wolfman composes perfect pastiche of Burroughs' writing. The story is first-person narration - like most of the John Carter books - and maintains Burroughs penchant for crazy cliff-hangers, occasionally long exposition, and John Carter famous dumb luck. The basic idea is good too: a cabal strives to control the air generators, which provide all the atmosphere on Mars, and use them as a pogrom to destroy everyone else. It starts off fine but I quickly found myself losing interest as the story went on for 10 issues with more contrived problems and melodrama occurring in each episode, with little character development. It was adequate at best. The second section contains the "Master Assassin of Mars" arc written by Chris Claremont (of X-men fame) and drawn by a variety of people, notably Ernie Colon, Mike Vosburg, and Frank Miller. The story is a bit of a mess. An assassin has attempted to slay John Carter (for unknown reasons) and Dejah Thoris rushes off to avenge her beloved before discovering he isn't quite dead. The story then spends approximately six issues on Dejah and John imprisoned by a hereto unknown Martian civilization. Dejah is forced to become a concubine for the chief and John spends his time getting into and out of trouble. The emotional drama of Dejah's sacrifice of fidelity for John is intriguing but is resolved so quickly and without repercussions that I was left wondering what was the point of the previous 6 issues. Apparently none, because the story immediately jumps into the search for the Master Assassin after this long distraction with nary a look back. You could skip those six issues and have missed nothing of importance. When we jump back into the Master Assassin story, we learn details of the conspiracy that would have been helpful earlier in the story. Also, the rotating artists rob the series of any momentum. The Vosburg issues in particularly look flat and unimaginative. The storytelling and narrative is done well but there is nothing particularly interesting to look at on the page, except of the Frank Miller issue and an issue inked by Ernie Chan. This arc also involves a plot to control Mars but this time the Master Assassin seeks to unite all of the tribes - well, except for maybe those hidden ones - to create a more civilized society. and if he has to kill a few people to do it....oh well. How John Carter's assassination fits into that plan is never clearly explained. Effects seem to occur with little cause in this series. Ridiculously overwrought and violent, like stepping into the fever dream of a barely pubescent teenage boy raised on pulp fiction, pin-ups, and seedy sci-fantasy. So, you know, I love it. 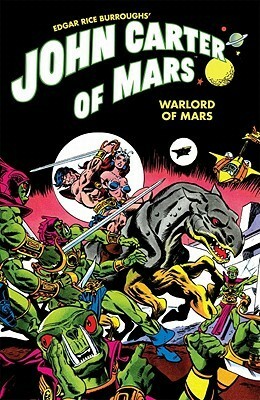 Collecting Marvel Comics' John Carter, Warlord of Mars, which ran from June 1977 to October of '79, this Dark Horse collection predominately features the writing of Marv Wolfman, whose prose respectfully and wonderfully mimics the source material of Edgar Rice Burroughs' Barsoom novels. There's tremendous art b Ridiculously overwrought and violent, like stepping into the fever dream of a barely pubescent teenage boy raised on pulp fiction, pin-ups, and seedy sci-fantasy. So, you know, I love it. Collecting Marvel Comics' John Carter, Warlord of Mars, which ran from June 1977 to October of '79, this Dark Horse collection predominately features the writing of Marv Wolfman, whose prose respectfully and wonderfully mimics the source material of Edgar Rice Burroughs' Barsoom novels. There's tremendous art by Gil Kane, Carmine Infantino, and Frank Miller, and later issues which feature scripts by Chris Claremont of Uncanny X-Men lore. This edition features a wonderful introduction by Michael Chabon, whose script -- I've gotta believe, anyway -- for Disney's big screen adaption John Carter hewed closer to the magic of this series than what ended up on the screen after rewrites, focus groups, and studio machinations (the film utterly bombed at the box office). Some great art- some lackluster story lines. Some great quotes and amazing panels. Sometimes old comics are just what I need. This massive collection of Marvel comics adapting the John Carter of Mars characters. I am not clear having only read the first John Carter book, but I think it is mostly stories created by the comic writers usually occurring in the period of his first visit to Mars which the first book sort of skims over. Many strange and wonderful creatures and machines are on display that our main characters have to contend with. The stories of swashbuckling adventure are evocatively told in this comic, very t This massive collection of Marvel comics adapting the John Carter of Mars characters. I am not clear having only read the first John Carter book, but I think it is mostly stories created by the comic writers usually occurring in the period of his first visit to Mars which the first book sort of skims over. Many strange and wonderful creatures and machines are on display that our main characters have to contend with. The stories of swashbuckling adventure are evocatively told in this comic, very typical of 70s comics and including various notable creators like Marv Wolfman and Chris Claremont. The violent and amoral (although not completely unprincipled) aspects of the main characters is often on display, often involved in brutal struggles for survival. This story of an Earthman who displays incredible strength and leaping power (thanks to lower gravity) when mystically transported to Mars is sort of what you might imagine by the idea of Conan on Mars with the occasional explosive radium round or flying barge thrown in. Imitation Burroughs that fails to do justice to the original. I picked this up after watching the John Carter movie on a plane coming back from Europe. I have always been a fan of Burroughs Barsoom, and I had read the original comics many, many years ago. I wanted to re-read them, and this was an affordable way to do so. This collection is reprinted in black and white, and the lack of color enhances the artwork. The stories are well paced and the art adds to the impact. A good read. I enjoyed slipping back in time and reading these again. This is the quality I picked this up after watching the John Carter movie on a plane coming back from Europe. I have always been a fan of Burroughs Barsoom, and I had read the original comics many, many years ago. I wanted to re-read them, and this was an affordable way to do so. This omnibus is definitely worth the price tag! Marvel's John Carter series was a fun comic book, but one I'd never think to ever see reprinted. The entirety of the series featured adaptations of two Edgar Rice Burroughs novels, along with some shorter tales. Lots of great artwork, from Gil Kane, Dave Cockrum, Mike Vosburg, Ernie Colon and many more. Well over 30 issues of sci-fi goodness reprinted in full color! Collecting Marvel comics John Carter comic series. Nice art and some decent sci-fi swashbuckling adventure. The writing tends to lead to a ton of captions per page, trying to ape Burroughs style, which can slow the pace to a crawl, but otherwise a fun read. The comic books were definitely a good subversion from the first five novels by Edgar Rice Burroughs. They at some points seemed as revisions of different stories in the novels revamped with John Carter and Dejah Thoris as the main characters. Maybe this was a classic and good old fashioned sci-fi fun, that was just the problem. There are "good old" stuff and then there is stuff that is just old. This was just old and time had not been kind to it. Dave Cockrum! C'mon, Goodreads, one of these authors, the comics artist - more than an illustrator - is the late, great, Dave Cockrum. Did not finish. The forward was great, but the pace of the story was sluggish compared to the original novels. Good old fashioned si fi.